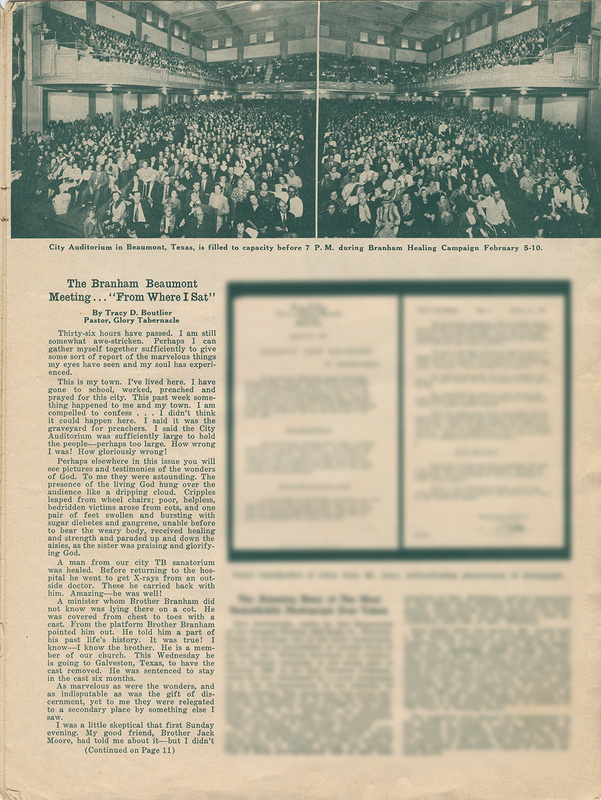 The following article was originally published in the March, 1950 issue of The Voice of Healing Magazine. 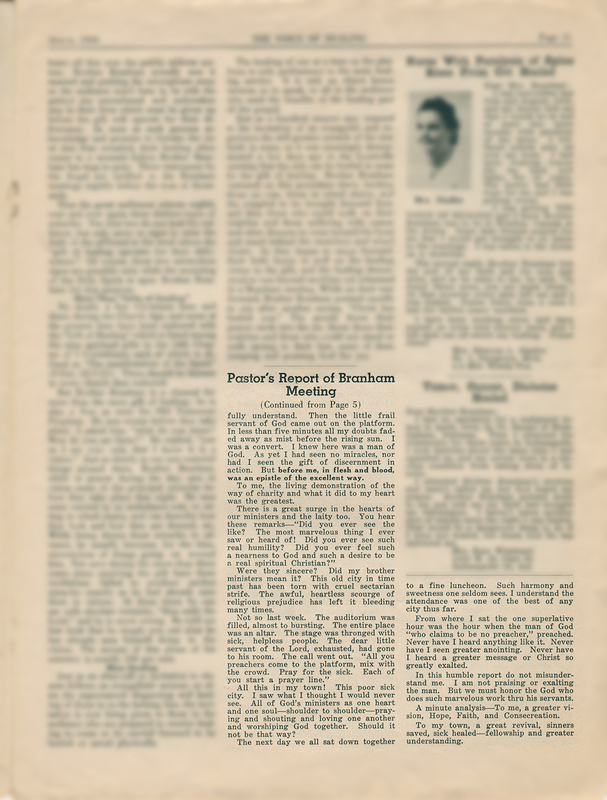 It was written by a Beaumont, Texas pastor from his experience in Brother Branham’s meetings. Get ready, because you are going to love this! Thirty-six hours have passed. I am still somewhat awe-stricken. Perhaps I can gather myself sufficiently to give some sort of report of the marvelous things my eyes have seen and my soul has experienced. This is my town. I’ve lived here. I have gone to school, worked, preached and prayed for this city. This past week something happened to me and my town. I am compelled to confess… I didn’t think it could happen here. I said it was the graveyard of preachers. I said the City Auditorium was sufficiently large to hold the people – perhaps too large. How wrong I was! How gloriously wrong! Perhaps elsewhere in this issue you will see pictures and testimonies of the wonders of God. To me they were astounding. The presence of the living God hung over the audience like a dripping cloud. Cripples leaped from wheelchairs; poor, helpless, bedridden victims arose from cots, and one pair of feet swollen and bursting with sugar diabetes and gangrene, unable before to bear the weary body, received healing and strength and paraded up and down the aisles, as the sister was praising and glorifying God. A man from our city TB sanatorium was healed. Before returning to the hospital he went to get X-rays from an outside doctor. These he carried back with him. Amazing – he was well! A minister whom Brother Branham did not know was lying there on a cot. He was covered from chest to toes with a cast. From the platform Brother Branham pointed him out. He told him a part of his past life’s history. It was true! I know – I know the brother. He is a member of our church. This Wednesday he is going to Galveston, Texas, to have the cast removed. He was sentenced to stay in the cast six months. As marvelous as were the wonders and as indisputable as was the gift of discernment, yet to me they were relegated to a secondary place by something else I saw. I was a little skeptical that first Sunday evening. My good friend, Brother Jack Moore, had told me about it – but I didn’t fully understand. Then the little frail servant of God came out on the platform. In less than five minutes all my doubts faded away as mist before the rising sun. I was a convert. I knew here was a man of God. As yet I had seen no miracles, nor had I seen the gift of discernment in action. But before me, in flesh and blood, was an epistle of the excellent way. To me, the living demonstration of the way of charity and what it did to my heart was the greatest. Were they sincere? Did my brother ministers mean it? This old city in time past has been torn with cruel sectarian strife. The awful, heartless scourge of religious prejudice has left it bleeding many times. All this in my town! This poor sick city. I saw what I thought I would never see. All of God’s ministers as one heart and one soul – shoulder to shoulder – praying and shouting and loving one another and worshipping God together. Should it not be that way? The next day we all sat down together to a fine luncheon. Such harmony and sweetness one seldom sees. I understand the attendance was one of the best of any city thus far. From where I sat the one superlative hour was the hour when the man of God “who claims to be no preacher,” preached. Never have I seen a greater anointing. Never have I heard a greater message or Christ so greatly exalted. In this humble report do not misunderstand me. I am not praising or exalting the man. But we must honor the God who does such marvelous work thru his servants. A minute analysis – To me, a greater vision, Hope, Faith, and Consecration. To my town, a great revival, sinners saved, sick healed – fellowship and greater understanding.